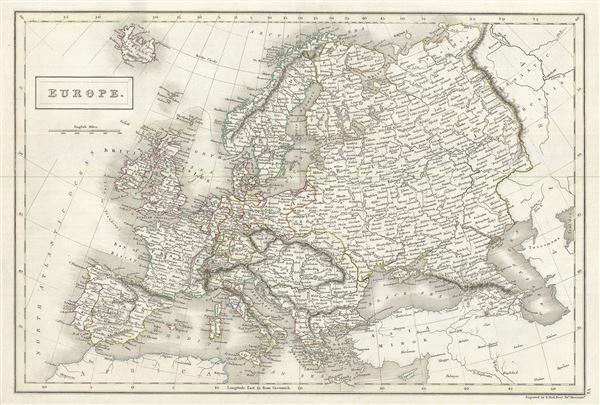 This is an attractive example of Adam and Charles Black's 1844 map of Europe. It covers the continent in its entirety from the North Atlantic Ocean to the Caspian Sea and from the Arctic Sea to the Mediterranean Sea, including Iceland. It shows the Austrian Empire at its height, the many states of the German Confederacy, and a pre-Garibaldi Italy split into numerous small duchies and states. It notes the legendary and semi-mythical whirlpool known as the Lofoten Maelstrom (Malstrom) in northwestern Norway. Various towns, cities, rivers, mountains and several other topographical details are noted with relief shown by hachure. This map was created at a time in history that witnessed the unification of Italy and saw the British Empire rise to its peak. It was also a time of decline for the Ottoman Empire. Issued following the defeat of Napoleonic France and the Congress of Vienna, Europe is shown under a new peaceful balance of power, centered on the five most important powers (also referred to as the five 'Great Powers'): the United Kingdom, France, Russia, Prussia and the Austrian empire. Alas, the 'peace' was but an illusion as the treaties ending the Napoleonic era were inherently flawed. Old rivalries festered and nationalism, liberalism, revolution (industrial and otherwise) was once again on the rise throughout Europe. This map was engraved by Sidney Hall and issued as plate no. VI in the 1844 edition of Black's General Atlas.